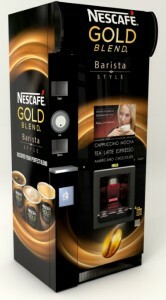 Nestlé Professional are aiming to bring the next generation of their premium instant coffee to vending customers with the new Nescafé Gold BlendBarista Style floor standing self-serve coffee solution. It offers a range of premium coffee shop-style beverages which can be customised to meet individuals’ particular tastes. With coffee chain market sales expected to reach £4.1 billion by 2018 and Cappuccino and Latte becoming the nation’s favorites, barista style coffee has never been more popular. “Coffee sales are expected to grow 10% by 2018, premium speciality coffees have hit the mainstream and consumers are increasingly expecting a full coffee menu wherever they go. The take-away option has grown more than 20% over 5 years with 1/3 of coffee drinkers now enjoying a take-away cup at least once a week. 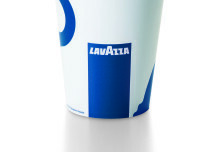 There’s now a clear opportunity for the out-of-home market to offer a machine that guarantees great tasting, barista style coffee at consumers’ convenience,” said Lynn Little, Nescafé Ingredients Lead at Nestlé Professional.